in red, circled once overhead and disappeared out of sight. 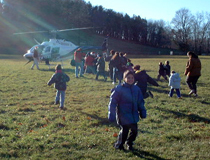 As children tugged on their parents’ arms and asked where Santa had gone, a gust of wind announced the final descent of Santa’s helicopter. “He aggravated us by flying over,” said Dylan’s brother Alex Genovese, 10. But the second pass over the club wasn’t enough to deter him and many of the other 100 children gathered at the club from dashing over to meet St. Nick. Santa “is cool, he’s got a pipe,” Alex ran back from the helicopter to report to his siblings. Five of the seven Genovese children attended the party with their mother Sue. The household consists of three biological children, two adopted children, including Dylan, and two foster children, including Alex. The Genovese joined other children from the foster care system, North Shore homeless shelters and the Head Start program who were invited to meet Santa and receive gifts Saturday. The Manchester non-profit organization Education Outbound sponsored the event. Manchester resident Megan Connolly started Education Outbound in 2000 to provide field trips for schools that couldn’t afford them. Saturday marked the third annual Christmas party she organized in conjunction with the Department of Social Services. Children are the center of the event for John Donovan, the owner of the Manchester Athletic Club and an Education Outbound board member. He flew Santa to the club in his helicopter Saturday. He decided to make two passes over the club so he could ensure that a late bus carrying children from Peabody had arrived in time to see the landing. “We didn’t want the 20 kids to miss Santa,” he said. Each child at the party had a chance to visit with Santa, who presented each one with a wrapped gift and a stuffed animal. Dylan’s sibling had to help him carry a white bear that was almost as tall as him and a large box that contained a Queasy Bake Oven, a play oven with recipes featuring treats that look like worms, mud, and rocks. He had been wishing for the gift and was glad Santa remembered. “When I get home, can I eat some of this?” he asked his mother. Phyllis and David Mondello adopted Noah from Russia when he was 14 months old. Noah’s brother John, 2, officially joined the family last year when the Mondellos adopted him. The Mondellos also take care of foster children, including a 4-year-old boy who moved in two weeks ago. Phyllis Mondello headed to the front of the crowd to see the boys meet Santa Claus. She said her children give the holidays meaning.